In addition to the wide range of measurement functions and capabilities common to all Series 2000 DMMs, the Model 2001 has many other advantages for test system builders. While other DMMs may claim to offer 71/2-digit resolution, they typically must average multiple readings to achieve their specified resolution, which slows the reading rate significantly. In contrast, the Model 2001’s true 71/2-digit resolution is based on a 28-bit A-to-D converter, so no averaging is needed to discern smaller changes. This high resolution also provides greater dynamic range, so it’s possible to measure from 1µV to 20V on a single range and avoid range-shift errors. 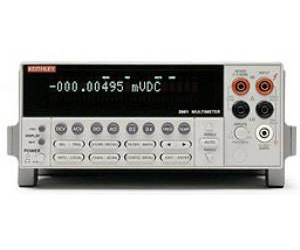 Unlike the Model 2000 or 2010, the Model 2001 offers the ability to make peak spikes measurements without the need for a separate oscilloscope. Its internal peak detector can catch 1µs spikes, such as power supply spikes and transients, AC line power surges, and short-duration drop outs on components, as well as up to 1MHz for repetitive signals. The Model 2001 can automatically display and store the highest value, or display the maximum and minimum values of spikes.